The long overdue quilt post! Tomorrow Addy and I will be on our way to Illinois for 16 days. Now that the list-making and packing are done (I fit 2 pairs of running shoes, 2 pairs of sandals, heels, 2 dresses plus all other essentials for the trip in a small roller bag!! ), I thought I'd blog a bit! This quilt has been finished for a few weeks, but we just found the time to take pictures of it this afternoon. I started this quilt as part of the Sparkle Quilt-Along over at Canoe Ridge Creations and In Color Order. 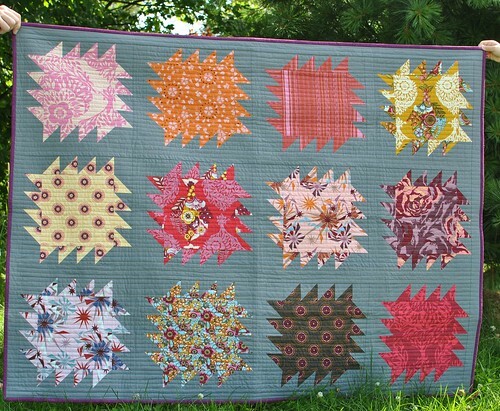 The large blocks of print in the center of each sparkle immediately attracted me to this quilt, and reminded me that I had a small stash of Innocent Crush just begging to be cut up! I decided to use a landscape layout for these blocks, because I intend to hang this quilt behind our couch (one day, when our couch is actually up against a wall!). For the back, I pieced all of my scraps together and filled in the gaps with some solids that I had on hand. The pink is Kona in pomegranate, the purple is Kona in eggplant and the brown is Kona in taupe. 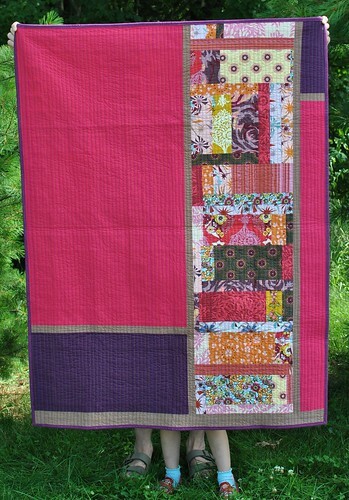 I love that the quilting runs vertically when the quilt is hung this way. I think it flows so well! I left a label off of this quilt so that I could hang it with either side facing out. 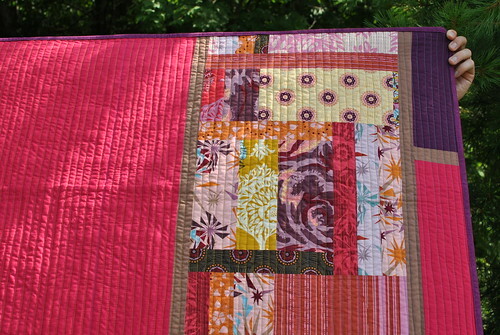 Binding: Quilter's Linen in magenta, I think! I'm so happy to have this quilt finished! 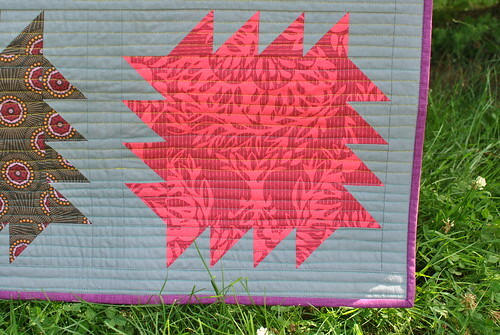 I don't like to have a ton of WIPs, plus I wasn't in love with this quilt before the quilting. I think that's probably why I chose to quilt it with bright colored thread-I wanted to jazz up the flat feeling that I was left with when staring at all of the grey! 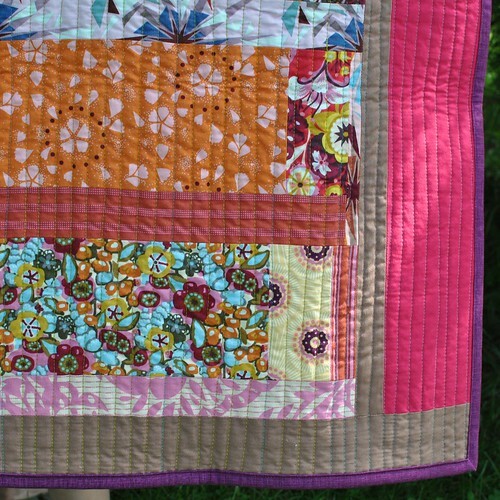 Now that it's quilted, though, I'm totally in love with it. Unfortunately our living room doesn't allow for our couch to sit against a wall...so I'll just have to wait to hang this one. I have a few more projects to share (some of which are gifts for friends in IL) so hopefully when I'm back at the end of July I will be able to blog a bit more regularly!